Strong words! Yet fans and residents can appreciate the sentiments. There are no holds barred on Saturdays in Alabama. The state comes to a sharp stop. Football takes center stage. It has for scores of years. When you’re covering a perennial national power and you’re beloved by the citizenry, would you ever give up your job? There’s an interesting twist and it’s not “Yankee go home.” Gold was reared in Brooklyn. His dad was the head of a local Jewish Community Center. If Mel Allen can migrate from Alabama, land in New York and become the most cherished Yankees’ announcer in history, the geography can take a reverse course too. And Gold is a household name in the Yellowhammer State. The football program has won six national championships since 1992 and Gold, in his 30th year as the team’s voice, has called all six. There’s not another college football announcer in America who’s had that lofty privilege. Those who’ve listened to Eli, whether it’s a full game or even a highlight on network television, know that the man in the booth is blessed with a golden voice. He has the goods; he can make a shopping list at Home Depot sound striking. And interestingly, all these years later, there’s just a hint of his Brooklyn roots. He grew up in the broadcast business during generations when provincial accents weren’t always acceptable. So he worked painstakingly on not sounding like a New Yawker. 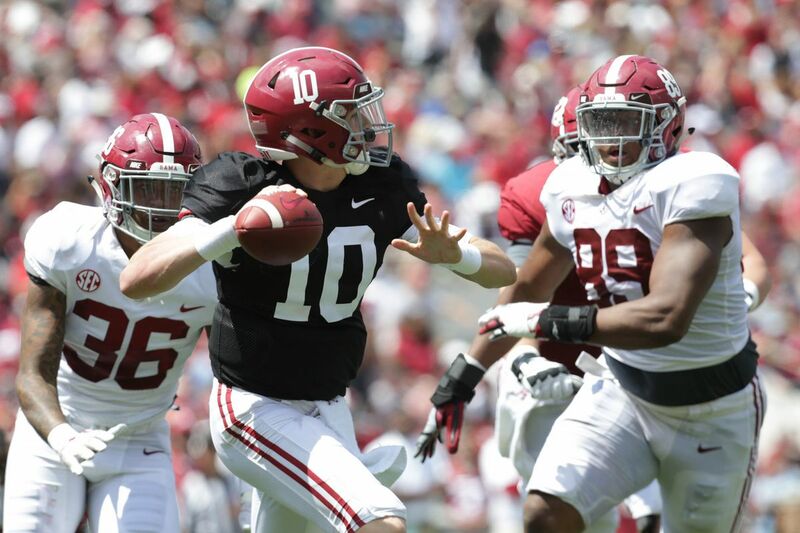 Gold, 64, proudly points out that he shares his Jewish roots with visible Southern sports figures; the late Mike Slive, commissioner of the Southeastern Conference, the late and legendary voice of Mississippi State, Jack Cristil and Paul Finebaum, popular ESPN commentator on college football. Fondling his words stylishly, Gold tells me it was a circuitous trip before landing the Alabama gig. There were lots of stops along the way and tons of bus miles through long stretches of monotonous American highways. He can regale you with stories of the road, even making those sleep-inducing bus trips sound invigorating. When I first met him in NYC over 40 years ago, he told me that his passion was hockey, “I love the game and that’s what I would love to do.” And so he did, jumping from one minor league team to another and from one hockey league to the next; hoping to climb the ladder. He finally did – somewhat at least- landing a job in the World Hockey Association, which in the 1970s attempted to compete with the NHL. It’s of course where Wayne Gretzky first sparkled and grew his prominence. The Toronto Toros were a WHA team that made little competitive inroads in Canada, playing in the shadow of the NHL’s Maple Leafs. So, they moved to Birmingham and Gold wound up getting the radio job. Beginning in 1976, he called hockey in the heart of the South. In the Q&A, he tells us how it later led to NHL work, more visibility in Birmingham on talk shows, a stint calling minor league baseball for the Barrons and eventually the coveted gig, broadcasting University of Alabama sports. How many times have you heard Verne Lundquist, or Uncle Verne as he’s often fondly referenced, introduce a highlight on the SEC/CBS telecasts; “Let’s go to our friend, Eli Gold.” Then, you’d hear Gold punctuate a big touchdown smoothly, dramatically and electrically. Many also knew Gold as a prominent member of the NASCAR broadcast team for 40 years before he left racing in 2016. Quick on the learning curve, Eli picked up NASCAR and college football in a hurry. The two sports were hardly big in Brooklyn in his youth. As for hockey, Gold still does what got him into the broadcast game. He supplements ‘Bama football, doing minor league hockey in Birmingham. From chartered flights with the Tide in the fall to unending bus trips with a minor league hockey team in the winter, he adjusts. The travel for Gold is only a means to an end. He’s doing what he likes. Just give him the microphone and he’ll show you why. You knew at a very young age that you wanted to be a sports broadcaster. But in your wildest imagination, did you envision a Brooklyn boy making it big in Alabama? In high school, I sold peanuts at Madison Square Garden which would give me an opportunity to hang around near the press box and close to the broadcasters. I was eaten up by the business. But no. I would never have believed that I would end up in Alabama where I’ve now lived for over 40 years. Of the announcers you befriended in New York, was there anyone in particular who helped you? Yes, Bob Wolff, who called both Knicks and Rangers games and was a Garden executive too. He assisted in getting me a job as an office boy at MSG Corporation. I made a unique deal. Instead of getting paid cash, I received a pass to every single Garden event, be it pro sports, college basketball, concerts, track or non-sports. It enabled me to practice broadcasting by recording games into a cassette recorder. Then, when I would deliver mail to Bob’s office, I would ask him to critique my tapes and he would evaluate them, make suggestions and encourage me. As a young aspiring announcer, I couldn’t ask for more. How else did you prepare? I loved baseball so I would sometimes skip school and sit in the grandstand seats at Yankee Stadium. Back then a seat was $1.50. I would find an empty section where I wouldn’t disturb anyone and I would practice my baseball play-by-play. When I met you many moons ago, your broadcast eyes were set on hockey. You did a year of the NHL in St. Louis and a year plus in Nashville. That’s it. You’ve had great success with other sports but what happened to hockey? So NHL general managers converged on Birmingham that final season to scout potential talent who would eventually be available through a dispersal when the season ended. Emile Francis the general manager of the St. Louis Blues was one. Francis would sit in the press box where he could hear my calls. As fate had it, there was a TV opening the following season in St. Louis when a simulcast led by the great Dan Kelly was split, Francis recommended me and I got the TV gig. The split of radio and TV lasted one year and so did I; although I felt I did a good job. Kelly was back doing a simulcast the following year. Years later, I got the Nashville Predators job by dumb luck. I was already doing ‘Bama football and was on the food line in the media room in Nashville where we played Vandy. David Poile, the Preds’ GM was on the same line. He asked me whether I would like to do hockey again so I ended up there for one full year of radio and some part-time work for a couple seasons afterward. 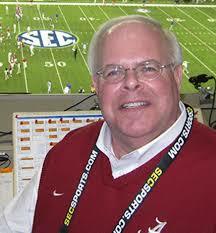 You’re the popular Voice of Alabama football. New York is not at all a hotbed for college football. For years, you were also very visible, broadcasting NASCAR; hardly a sport with Brooklyn roots. How did your roads lead to these two sports? Traveling all those miles with minor league hockey in the early to mid 70s, I always had my transistor radio on. I had seen some NASCAR as a kid on Wide World of Sports. Somewhere in the South in 1975, I picked up NASCAR radio coverage and I said to myself I could do this. I contacted the Motor Racing Network and sent them a hockey tape because it was all I had. They brought me to Charlotte in 1976 based on a hockey tape! I was told it would be a live audition covering the World 600. They said if they liked my work, I would have a job. They apparently did. I stayed for 40 years! As for Alabama, I was quite visible in Birmingham after the WHA left town in 1979. I did Barrons baseball, a AA franchise and had the first sports talk show in town. And of course, I was on nationally with NASCAR. When the basketball job opened at Alabama, Coach Wimp Sanderson had heard me and he liked my work and got the process going for me. I got the basketball broadcasts in ’88 and football in ’89 after John Forney finished his 30th season. Now, I myself am in my 30th year. Coach Nick Saban has had a choppy relationship with the media. Many writers and broadcasters don’t speak kindly of him. Is the reputation deserved? My relationship with him is good. I’m not mainline media. We have a good business relationship. We don’t hang out or go out for a meal. He’s got better things to do than hang out with old Eli. I ain’t winning Alabama any football games. Nick can be very imposing. People are on their heels when they interview him. He uses the media podium to get messages across. I don’t get a ton of insight from him. I might pose a question sometimes, privately. You can’t ask Nick stupid questions. You have to be prepared. Before I begin an interview with him, I might ask, ‘Is there anything I need to know?’ That’s about it. Who are your top five broadcasting idols? There are so many. Let’s make it a list of seven. Mel Allen, Marv Albert, Kevin Harlan, Vin Scully, Bob Costas, Al Michaels and Howard Cosell. Oh, I can go on? I would love to add Verne Lundquist. He was that solid! Most college announcers who do college football also do their school’s basketball. You don’t. Any reason why? I had so many outside opportunities around NASCAR, TNN and the Arena Football League. I did some work for CBS and NBC. I even worked a game with the late Al McGuire. So Alabama AD Mal Moore was kind enough to allow me to do football only. I gave up basketball after the 2001-02 season. So how do you get your hockey fill today? I actually do most of the 56 game schedule of the Birmingham Bulls of the Southern Professional Hockey League. Yes, same nickname as the previous WHA team. I love it. It’s not the NHL but I get on the bus and talk hockey with the players. Lots of fun! Had the chance to hear some of Gold’s nascar work and Alabama play by play, what a real treat to hear his call. Classic, well timed and made me feel as if I was right there at the game or race track. They do not make them like Eli Gold anymore. He probably won’t remember, but Eli acknowledged mine as the first fan letter he ever received while broadcasting the Long Island Cougars North American Hockey League hockey games back in 1972-3(?) on WRCN out of Riverhead. His contemporaries were, amazingly enough, Bob Costas (Syracuse Blazers) and Lee “Hacksaw” Hamilton (Mohawk Valley Comets) the former being a great team the later being the worst.